Let’s get it on the table: nothing about Circus Peanuts makes sense. Bright orange, peanut shaped, and banana flavored…what? 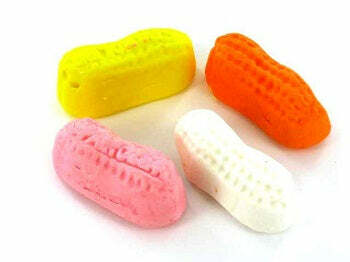 Despite the confusion, Circus Peanuts have had a long, fruitful life dating all the way back to the 1800s. People either love them or hate them, and they’ve achieved a sort of cult candy status amongst the populous. Let’s try and get to the bottom of this strange snack, shall we? The main selling point for circus peanuts, according to manufacturers, is nostalgia. Most notably an “old fashioned” candy, the enigmatic marshmallow peanut still continues to be produced at a rate of tens of thousands of pounds per day. The recipe is simple: sugar, gelatin, corn syrup, flavor and color. Seems reasonable. Seems traditional. And yet, something about the circus peanut remains shrouded in mystery. There isn’t much light to be shed on the creative process leading up to the circus peanut we know and love (or hate! ), but there is a small amount of history to be dissected. The name and shape include the only cohesive decision making to be seen. Everyone remembers going to the circus and seeing people munch on big bags of salty peanuts, right? And there is that idea that circus elephants enjoy eating peanuts, but that’s still debatable. Do they even really like doing that? Does anyone have an elephant we can interview? All that aside, calling a peanut shaped candy a circus peanut does seem like a creative and marketable choice. However, these candy peanuts are made of fluffy (or sometimes very hard) marshmallow, which contradicts the idea of a crunchy peanut. On top of that, the marshmallow is molded into shape, unlike traditional mallow methods. 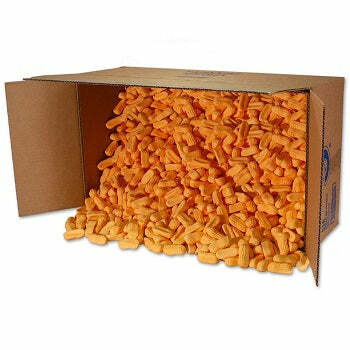 This gives the circus peanut a particular density and texture that varies from fresh and moist, to stale and chewy. It is versatile, that much is true, and both of these variations have a dedicated group of fans. The process gives it a certain…je ne sais quoi that creates debate and encourages conversation. But why, oh why, does it taste like banana? The truth is, no one actually knows. 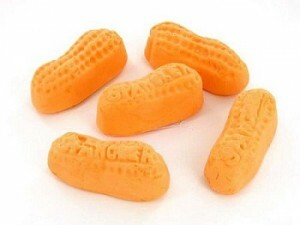 Several companies produce the Circus Peanut without question, sticking to the recipe and never asking the peanut to change itself or what it stands for. After all, isn’t that what love is about? The banana flavoring seems to just slip silently through the cracks, passing by without rhyme or reason. It’s part of what makes the peanut so intriguing. Also, it’s orange. There isn’t much to be said about that aside from: “Orange is kind of peanut color,” which is perfectly fair. It’s certainly eye-catching! But wouldn’t yellow make more sense, seeing as it is banana flavored, and yellow is also kind of peanut color? Ah, but making that much sense would defy the integrity of the circus peanut enterprise, which seems to thrive on its inconsistencies. At the end of the day, manufacturers are continuing to produce and sell this bizarre candy at a constant and steady pace. In mid-2005, one of the Circus Peanut producers, Spangler candy, experienced a 10% spike in sales that has proved to be a properly baffling situation. The vice president of Spangler, Kirk Vashaw, when questioned about the increase, stated: “We’re a little perplexed why it’s going up. The circus peanut is such an enigma.” Even the people profiting off this strange candy seem to be caught in the throes of its mystifying nature. It seems that the best way to handle the perplexing peanut is just to give in to it. Some things in life aren’t meant to make sense, and the Circus Peanut is one of them. Here’s to this freaky snack, and the people that love it. Got any opinions about the Circus Peanut? More history? Anonymous tips? Leave them in the comments section below! Any insight will be greatly appreciated.